An accurate counting scale can make a huge difference in a business making money. An accurate counting scale can be used in various part of a business. Below are some locations you can use a counting scale. Receiving Department, accurately verify the count of received goods that come in from your purchase orders. The Stockroom is another place to consider since a scale should virtually eliminate overages to the production floor and keep items in the stockroom until they are needed. Finally, the Shipping Department could use a parts counter since you don't want to over-ship products. Let's face it there are lots of electronic counting scales on the market and all kinds of different price ranges but what makes one scale worth $1500 and one scale worth $100? Often it's the components inside that make the big difference. Many of the super low price counting scales use low quality components from the A/D chip to the load cell. And that can often lead to poor performance and inconsistent accuracy at best. That's one reason it's smart to choose a quality brand name like Brecknell. Now generally speaking in most cases you probably don't need to spend $1500 either. Our experience has found that there are quite a few good parts counters on the market that are priced anywhere from the three hundred dollar range up to around a thousand dollars. It depends on what features you like and what you need. Contact us for product reviews and recommendations based on your specific needs. The Brecknell Scales B140 is an advanced, higher accuracy coin counting scale with increments for good resolution on counted coins. 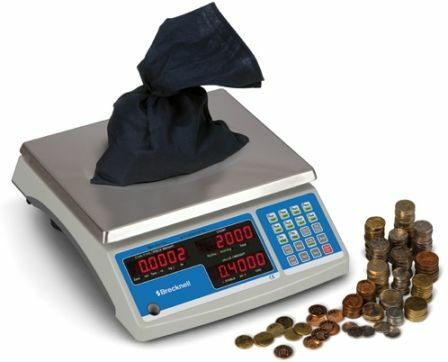 The 30 kg/60 lb capacity functions either as a parts counting or coin counter. The B140 scale operates on 110VAC power supply and/or rechargeable battery. The B140 from Brecknell Scales features advanced higher accuracy counting scale with increments for good resolution on counted parts. Three bright LED displays with three brightness levels. Rugged ABS plastic base with stainless steel weight platter. The Salter Brecknell B140 scale comes standard with PLU's, time and date, upper and lower count limits, accumulation and preset tare with RS-232 function. The 60 lb capacity functions either as a parts counting or coin count scale. Operates on either 110VAC power or built-in rechargeable battery.